Sonos (SONO) prices its IPO at $15 per share, below the expected range of $17 to $19. Wall Street is skittish about consumer-electronics hardware companies like Fitbit and GoPro, but Sonos is different. 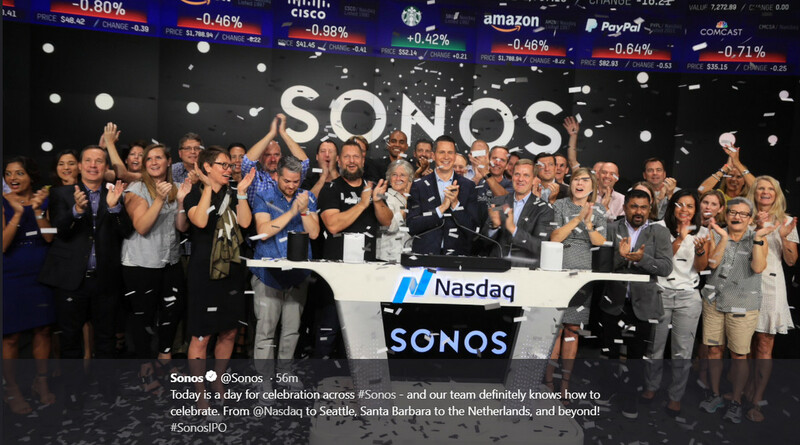 Sonos (Nasdaq: SONO) prices its IPO at $15. Sonos (Nasdaq: SONO) has priced its IPO at $15 per share, which values the company at nearly $1.5 billion. Not bad. Not bad at all. But the wireless audio icon had expected to fetch $17 to $19. In April, MarketWatch suggested Sonos could be worth up to $3 billion as a public company. Analysts, investors, pundits, and people with impressively long resumes have worried about Sonos being an all-hardware play. Most put Sonos in the same league as Fitbit (FIT) and GoPro (GPRO), which haven’t fared well in Nasdaq land since going public a few years ago. But they also note that Roku (ROKU) – another hardware producer – has done quite well as a public company. Its IPO was priced at $14 per share and opened on Nasdaq at $15.78 in September 2017. ROKU finished its first day of trading at $23.63. Today it fetches more than $45 per share. Then again, Fitbit and GoPro saw early wins when they were young public companies too. FIT opened at $30 in 2015, traded in the high $40s early on, and now hovers in the $6 to $7 range. GoPro opened at $28.65 in 2014, climbed into the $80s and now goes for $5.50 to $6.50. In the CE hardware category, Fitbit and GoPro now trade below their IPO price; Roku, however, has thrived. Leading up to the IPO, several analysts commented on the challenges of hardware IPOs. Despite the company’s well-defined brand and technology, history has not been kind to pure play consumer hardware companies. Since its IPO, FitBit’s valuation has plunged to $1.6 billion from $6.1 billion, while GoPro’s market cap fell to less than $1 billion from $3.9 billion. Since Sonos generates nearly all of its revenue from one-time sales of hardware, the company could meet a similar fate. SONO will be the next big test of Wall Street's appetite for consumer electronics hardware. Soon after, Arlo (ARLO) will follow, as Netgear spins off its fast-growing surveillance camera division. Marketwatch wondered recently: Is Sonos a Fitbit or a Roku? Perhaps neither. 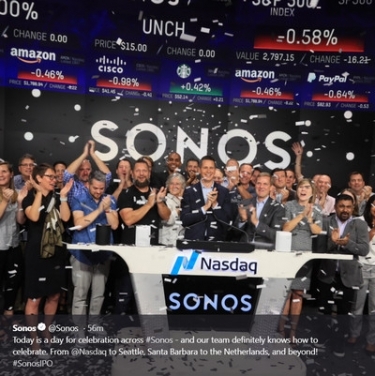 EquityZen’s Haslett pointed out that unlike Fitbit and GoPro, Sonos has been around for a while and its financials reflect a mature company. Investors in Sonos likely won’t be expecting massive growth the way early Fitbit investors were. Compared with Roku, though, Sonos doesn’t have an obvious path to becoming a platform-based business. Investors like platforms, software and recurring revenues, which Sonos doesn't have -- at least not in the traditional sense (see below). Our current agreement with Amazon allows Amazon to disable the Alexa integration in our Sonos One and Sonos Beam products with limited notice. As such, it is possible that Amazon, which sells products that compete with ours, may on limited notice disable the integration, which would cause our Sonos One or Sonos Beam products to lose their voice-enabled functionality. Amazon could also begin charging us for this integration which would harm our operating results. Granted, the "Risk Factors" spelled out in any prospectus always err on the side of dire, but analysts seem particularly troubled by this one. They shouldn't be (yeah, see below). They also worry, not surprisingly, about competition from Google and Amazon, both of which can (and do) slash prices on their popular smart speakers. Both also are working to improve audio quality on their respective devices. Amazon just rolled out equalizer tools for Echo, and Google Home made some mighty big Sonos-busting claims on the sound quality of its Max speaker, which uses Google’s famous AI expertise to adjust eq settings on the fly. Many of these partners may subsidize these prices and seek to monetize their customers through the sale of additional services rather than the speakers themselves. Our business model, by contrast, is dependent on the sale of our speakers. Should we be forced to lower the price of our products in order to compete on a price basis, our operating results could be harmed. I don't know a whole lot about valuations in the consumer-electronics business, but I do know something about the security and home-technology installation channels. They derive the most value from recurring monthly revenue (RMR) generated through security monitoring and other services. But their value also is improved through a different form of "recurring revenue," which is selling more stuff to existing customers on a consistent basis. A history of repeat business shows investors that revenue will continue to flow from an established and growing customer base. An impressive 60 percent of Sonos customers are repeat buyers, and there’s no telling where the spree will end. Here is where Sonos shines. An impressive 60 percent of Sonos customers are repeat buyers, and there’s no telling where the spree will end. More than half of Sonos households own more than one Sonos speaker and 27 percent own more than three. Unlike with Fitbit, GoPro and Roku, the Sonos products build an ecosystem. Each addition to a user’s collection bolsters the entire household experience. A new Playbar, for example, can be added to a PARTY mode to share the same tunes playing throughout the home. When Sonos finally delivers weather-proof speakers, the same tunes can follow the user outdoors. On the other hand, Fitbit bands, GoPro cameras and Roku streamers operate in their own little worlds. There is no reason to have more than one Fitbit per user or one Roku per TV. They don’t feed off each other and make the ecosystem more robust. But Sonos IS a platform. The platform is the wireless network, streaming software and user interface. Customers commit to the Sonos platform like they do to iOS or Android. Sonos shows “stable revenue streams” through repeat business, and the company is doubling down on marketing to its existing customer base. All Sonos needs is more stuff to sell. If Wall Street wants recurring revenue, they’ll get it in the form of intellectual property. Sonos has 630 issued patents and 570 pending. We’ve already seen the company win a patent fight against a relatively small player, HEOS (a Denon brand), but Sonos seems ready for the big guys. Apparently, Sonos played patent hardball to get Google to allow Google Assistant to share a Sonos speaker with Amazon Alexa. You know that "problem" of not having its own voice-control technology? Well, if Sonos can finagle a trifecta with native Alexa, Google Assistant and Siri, then they may be on to something. “We’re a startup who invented something that will be used in nearly every household in the world,” says Sonos VP of IP Mark Triplett. Indeed, Sonos claims to own the "foundational intellectual property for wireless, multi-room home audio," as we reported earlier. The company also claims "some of the first applications of mesh networking in the audio industry." Sonos is sure to collect licensing revenue and other capitulations from (would-be) patent offenders. But they are just as likely to license their platform – yes, platform – to third-party providers as an integral part of their business model. Not today, but someday, just like Roku. At the $15 price, Sonos is selling 13.9 million shares, bringing in more than $208 million. An additional 2 million shares are allotted to underwriters Morgan Stanley and Goldman Sachs. Several sources have reported that the offering was oversubscribed.